Home > Who Was Halsey Hall? Holler "Holy Cow!" in the eastern United States and people might think of Phil Rizzuto, the New York Yankees' shortstop-turned-broadcaster while a cry of "Holy Cow!" in Chicago brings Harry Caray to mind. Here in the Upper Midwest, though, "Holy Cow!" remains synonymous with the first man to ever use the expression on a baseball broadcast, Halsey Hall, one of the most beloved sports and media personalities this area has ever known. Those of my generation remember Halsey only as an announcer for the Minnesota Twins in the 1960s and early 70s. That's unfortunate, because Halsey had a long and colorful career prior to this, in broadcasting but also in newspaper work. Halsey was a man of many trademarks. A mention of his name conjures up images of green onions, cigars, and glasses full of scotch. Some people, though, think of stories when they think of Halsey. There were so many stories associated with him. There were the stories he told. Halsey was the consummate raconteur. For many in the 1960s, the best part of a Twins' game was a rain delay. That's because Halsey would fill the time with stories of baseball from an earlier era and of the colorful characters who played for the Minneapolis Millers and St. Paul Saints. During rain delays, Halsey was in demand from the opposing team's broadcast crew, as well. They put him on their stations and, as a result, Halsey developed a following in other American League cities. And just as Halsey could tell stories, there were many stories told about Halsey. Several revolve around his love of distilled beverages and the satchel full of liquor bottles that he lugged along on road trips. If asked about the contents of his bag, he would say it contained reference books. "If that was the case," said one colleague, "they were the only reference books I ever knew of that clinked." Joe Soucheray said Halsey had so many bottles in his satchel that, when he stepped off a plane, he sounded like a glockenspiel. And then there was the time a cub reporter once asked the venerable Mr. Hall why he bothered carrying his own liquor; after all, every town they visited had a bar. "My boy," Halsey replied, "you never know when you'll run into a local election." Some Halsey stories illustrate his irreverent nature, such as the manner in which he once described the arrival of the Michigan Wolverines onto the gridrion for a game against the Gophers. "Michigan comes onto the field in blue jerseys and maize pants. And how they got into Mae's pants, I'll never know." And then there was his fear of flying. Halsey spent a lot of time studying train schedules, hoping to find a way to reach his destination without having to flying. He never did warm up to the idea of flying, nor did he endear himself to airline agents when he would approach a ticket counter and ask for, "One chance to Chicago." His friends didn't help to ease his anxieties, either. Once, prior to a flight, they arranged to have a pilot walk past Halsey with a seeing-eye dog. How did this captivating character get to be the way he was? It could be that heredity played a part in the interests and aptitudes that Halsey was to develop. He has a fascinating family tree. Many of Halsey's ancestors were prominent citizens in their own rights. His maternal grandfather was a distinguished Missouri judge and his mother, Mary Hall, a noted Shakespearean actress. In the 1920s, Mary Hall was described as the "greatest stock actress alive today." Halsey had little contact with his mother throughout his life. His parents were divorced when he was a baby, and he was raised by his father's side of the family. On his father's side was a long line of newspaper men. Halsey's father, Smith B. Hall, was a publicist and newspaper reporter who chronicled the growth of the city of Minneapolis. His great uncle, Harlan P. Hall, was a co-founder of the St. Paul Dispatch. With this kind of lineage, Halsey may have born with ink in his veins. He entered the newspaper profession upon his discharge from the Navy in 1919. His first byline appeared in the Minneapolis Tribune in November of that year. He wrote for several newspapers in the Twin Cities on both sides of the Mississippi. He jumped to the St. Paul Pioneer Press in 1922; a few years later he came back to Minneapolis to join the sports staff of the Journal. After the Journal was purchased by the Minneapolis Star, Halsey's byline appeared in both the Star and Tribune. He had a variety of columns through the years; the two longest-running were "Here's How" and "It's a Fact." For many years he concluded his columns with the nostalgic "Do You Remember?" feature that was unrelated to sports. "Do you remember when kids went swimming in the raw in the creek where the Glenwood Chalet now stands?" "Do you remember when you opened a bottle of pop by giving the cap a resounding smack to release it?" Halsey's descriptive and highly colorful writing style was enjoyed by fans not just in the Twin Cities, but across the country. On several occasions, his articles were included in national publications that recognized the best sports stories of the year. "There's a one-two cleanup punch on the Celestial All Stars now. "Once again George Herman (Babe) Ruth is hitting ahead of Lou Gehrig. With the passing of the Babe, this peerless tandem of batting torture is reunited in pastures where all infields are green and from where they may look down upon current mortals weakly trying to emulate their feats. . ."
At the same time Halsey was writing for the newspaper, he was pursuing a full-time career in sports announcing. He started in 1923 with the Jack Dempsey-Tommy Gibbons heavyweight title fight in Shelby, Montana. Halsey called the fight, not from Shelby, but from a second-floor window of the Pioneer Press building in St. Paul. Because Gibbons was from St. Paul (he later served as Ramsey County sheriff for 23 years), there was great local interest in the bout. Halsey recreated the action from a Western Union wire and delivered a blow-by-blow account through a megaphone to the fight fans gathered on the street below. 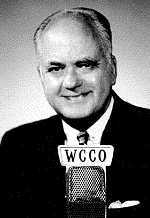 Halsey soon took to announcing in a more conventional manner--over the broadcast airwaves instead of out a second-floor window--and his voice became a familiar one to people throughout the Upper Midwest. His friendly delivery and contagious laugh was once described in a Sports Illustrated article as "redolent of happy days at Grandpa's house." Halsey had already established a following as a writer, but his popularity soared after he moved into broadcasting. In fact, his fame was so lasting that in 1979 he was voted as the top sportscaster of the 1970s in Minnesota--even though the poll was taken two years after his death. Just as he had done with newspaper work, Halsey jumped back and forth between radio stations. He started with WCCO and helped that station establish a national reputation it enjoys to this day as one of the giants of the industry. In 1935 he jumped to crosstown rival KSTP, but nine years later returned to WCCO and began a five-minute sports show that aired at 10:25 each evening. He shared a half-hour news block with Cedric Adams. So popular was the duo that when their segment ended every evening, airline pilots reported that they could see the lights in homes darken in droves throughout WCCO's listening area. In addition to his sports show, Halsey did a great deal of play-by-play announcing. In 1934 he hooked on with a pair of championship teams. One was Bernie Bierman's Minnesota Gopher football team, which was beginning a string of three-straight national titles. He loved the Gophers, and it was Halsey who came up with the now-familiar nickname of "Golden Gophers." He also started broadcasting games for the Minneapolis Millers, a minor-league baseball team that was in the midst of winning three American Association pennants in four years. Halsey called the play-by-play of home games from his familiar perch in the press box at Nicollet Park. When the team went on the road, though, Halsey broadcast the games from the radio studio, recreating the action from a Western Union wire, just as he had done with the Dempsey-Gibbons fight some years earlier. One might think that a full-time writing and broadcasting career would be more than enough to fill a person's time, but Halsey was able to fit in a couple of other sidelines into his schedule. He was one of the area's most highly-regarded referees of football and basketball games. He officiated primarily at the high-school and college level, although he also worked a handful of games in the National Football League on the two occasions that Minneapolis had a team in the NFL in the 1920s. On some occasions he did double duty by combining his roles as referee and reporter. After officiating a game, he'd bang out a story of the contest that would appear in the newspaper the next day. Halsey also stayed busy as a public speaker. He became the area's leading toastmaster as he regaled hundreds of audiences throughout the region as a speaker and as a master of ceremonies. Hubert Humphrey, himself a prolific orator, once called Halsey, "one of the few men who has given more speeches in Minnesota than I have." In 1961, Halsey became a member of the original broadcast crew for the Minnesota Twins. For many years his partners on Twins' broadcasts were Herb Carneal and Ray Scott. They both loved Halsey even though they may not of been too fond of some of his habits--particularly his copious consumption of green onions and his cigars. "Halsey always enjoyed a good cigar," Herb Carneal once said. "Unfortunately, those weren't the kind he smoked." Halsey's cigar once caused more than minor discomfort for his broadcast partners. During a game in Chicago in 1968, the ashes of Halsey's cigar ignited a large mass of ticker tape wire that had piled up on the press box floor. Smoke drifted upward and Halsey turned to see his sport coat, which was draped over his chair, in flames. The fire was brought under control, but not before a large hole had been burned in his jacket. News of the conflagration reached Minnesota and, when the Twins returned from their road trip, the 3M Company of St. Paul presented Halsey with an asbestos sport coach. Of the episode, Twins' catcher Jerry Zimmerman said, "Halsey's the only man I know who can turn a sports coat into a blazer." Halsey's colleagues maintain that life with Halsey was always an adventure--both on and off the air. Many fans recall the mixup in words Halsey experienced when trying to describe a promotion at the ball park in which all those attending received a free pair of pantyhose. "In promotions here tonight," he announced, "it was pantywaist night." Herb Carneal's favorite story of Halsey is of the night the pair, along with Merle Harmon, who had replaced Ray Scott on the broadcast crew, were out to eat at a fancy restaurant in Baltimore. When they had finished eating, the check was delivered to their table, and Halsey was taken back by the total. He called the waiter over and asked him to re-add the figures. "What are you trying to do?" he said. "Put the chef on a pension?" "The waiter pulled out his pencil, did a little addition, and said, "No sir, this is the correct amount." If that wasn't enough, Halsey then reached for his wallet and discovered it wasn't there. He probably had left it back at the hotel, but the combination of events was too much for Halsey. Before Herb Carneal or Merle Harmon could stop him, Halsey stood up and began tapping his water glass with his spoon. "Ladies and gentlemen," he announced to the patrons. "I want you to know this is the biggest clip joint I've ever been in. "Not only do they pad the check, but they also pick your pocket!" Halsey left the Twins broadcast crew following the 1972 season, but his name remained synonymous with baseball in the area thanks to Hal Greenwood, the president of Midwest Federal Savings and Loan, which was the prime sponsor of Twins' broadcasts at that time. Greenwood hired Halsey to be the Ambassador of Baseball with duties that included presiding over pre-game ceremonies at Met Stadium. Halsey received numerous awards through the years, but his greatest may have come in 1966 with a testimonial dinner at which more than 1,700 people turned out to honor him. Bill Veeck, the former baseball executive who was just elected to the Hall of Fame this year, was one of the speakers on the program and commented on the size of the gathering. He referred to his days as owner of the hapless St. Louis Browns and said, "With this kind of a crowd, we would have played a doubleheader!" Besides "Holy Cow! ", another favorite saying of Halsey's was "Same house, same wife, same suit--must be the gypsy in me!" This expression may well have summed up the simple approach to life he followed away from the public eye. While he may indeed have owned more than one suit in his life, Halsey and his wife Sula did live in the same house on Alabama Avenue in St. Louis Park for 55 years. And for most of those years, Halsey did not have an unlisted phone number. This did result is a certain amount of inconvenience for him, and Halsey could count on an occasional post-midnight phone call from a couple of drunks trying to settle a sports bet before the bars closed. Halsey would let the callers know how angry he was at their waking him up, but he'd also answer their question before hanging up. Another passion of Halsey's was poetry. His ability as a wordsmith manifested itself in many other manners and mediums than just through sports articles in the newspaper. "He thought words could solve anything," said his daughter, and Halsey often used poetry as a way of dealing with problems, whether it be family difficulties or health problems. The subjects of his poems could cover cheerier topics, as well, such as sports and soap operas. Halsey was an avid soap-opera fan and often said the greatest acting in the world could be seen on the daytime serials because, as he explained, "Every day is a brand-new performance for these people." He went to great lengths to watch his soaps. When he and Sula drove to Florida for spring training each year, he brought along a battery-operated television. It wasn't unusual for Halsey and Sula to pull off the road around one o'clock in the afternoon, hop in the back seat, and try and pull in a television signal. After leaving the Twins broadcast crew in 1972, Halsey continued to watch a lot of baseball. He was presented with a lifetime pass from the American League and still spent a lot of time at Met Stadium, watching the Twins. In his autumn years, however, Halsey was plagued with health problems. He had lengthy hospital stays in 1974 and 1975 because of heart troubles. And in January of 1976, his wife was injured in an accident at the Radisson Hotel. While ascending the stairs to the dais for a testimonial dinner for Hubert Humphrey, the Halls fell. Sula cracked her head on the floor and had to undergo brain surgery. She survived, but never fully recovered and finally had to be put in a nursing home. The final months for Halsey were lonely ones as he rattled around in his house without Sula. Then, on December 30, 1977, Halsey joined the Celestial All-Stars. He died of a heart attack at his home in St. Louis Park at the age of 79. Halsey was gone, but his stories live on, as do the honors. In 1985, Minnesota members of the Society for American Baseball Research organized themselves into a regional chapter and named themselves after Halsey. The Halsey Hall Chapter of the Society for American Baseball Research now exists. And in November of 1989, Halsey was inducted into the Minnesota Sports Hall of Fame. His plaque now hangs along with the other enshrinees in the Hubert Humphrey Metrodome. "Halsey Hall laughed his way through life, and he kept the rest of us laughing, too."